Small-sided games are great way to teach and train various soccer concepts. Here is SSG designed to help players understand defensive shape. 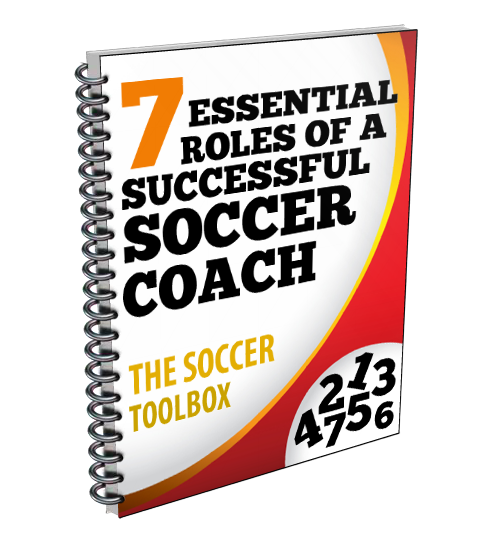 This Drill was provided by World Class Coaching, a great resource for coaching tools. The defending team sets up in a 4-2-3 or a 4-4-1. The attacking team is in a 4-3-3 formation without the 2 CB’s. The attacking team is trying to score and the defending team is trying to stop them. If the attacking team score, they win, if the defending team don’t concede they win. Execution:The term parking the bus is considered a negative in today’s game. It is considered a cheap tactic to stop another, probably a better, team from creating clear chances and scoring. Let’s be honest, it’s extremely hard to play against, and score, as well as highly frustrating. I for one can’t stand playing against it but in my frustration, I have accepted that sometimes it is necessary. Now would I do it for younger players of 12 and under, no. Not even 13-15 however at 16+ it becomes a vital tool to use. I do not advocate for it to be used all the time but in certain situations absolutely. What is the point of soccer at the top level? It is to win and nobody knows that better than Jose Mourinho. He does not care about people’s opinions on what he does, he cares about the result. Now that might not be the case for 16-18 year old players but make no mistake about it, players at this age want to win. In fact, all players want to win at any level, its normal, its healthy and I think winning has become a dirty word that people are afraid to use in youth soccer anymore as it’s all about development. Which I agree with but winning is development too. Do I think youth teams should win at all costs, no but its ok for coaches and players to want to win. You can do that and develop players at the same time. Now, back from my little tangent. What ‘parking the bus’ is, is really players behind the ball in an organized fashion denying penetration through numbers. It also teaches players to be patient and encourages communication. So the way Mourinho ‘parks the bus’, as described in my article analysis the Liverpool v Man Utd game on Oct 17th 2016, is he has his wingers drop back so they are level with his back for, making a back line of 6. His back 4 become very narrow to deny space between each player along the back line and the #10 drops down to make a narrow midfield 3. Depending on where players are at certain times it might not always be the #10 in the middle but there a narrow midfield 3 nonetheless. So, when the attacking team pass the ball around the defending team should look like below. The role of the defending team is to allow the attacking team as much time as possible with the ball when they have the ball ahead of them but to remain organized and close together. The reason for being so close together is if one players does get beat there is a 2nd then a 3rd and even 4th player close by something even Messi would struggle with. The likely hood of quick, accurate 1 or 2 touch passing to penetrate the sheer tight nit numbers is extremely low. When the attacking team slides the ball over to one side to avoid the 3 midfielders in the middle, the whole team slides with the ball to outnumber the attackers on that side. Even with a more attacking formation of a 4-3-3, there are 2 strikers and attacking midfielder and an advanced full back all forward but there are 7 defenders to their 4. Then there is a GK to get past. If the attacking team tries to switch the ball via a U shape or long diagonal, because there are 6 players in the back line it is easy for them to engage quickly with the opposite side. World Class coaching offers a wide variety of resources. Here is one that they are offerring to you FREE of charge. 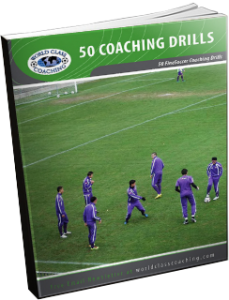 Just click the link 50 Small Sided Games That Make a Difference to get your copy.